Emails about our pups once placed. 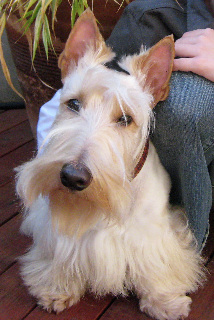 - Culton's Scottish Terriers AKC Scottish Terriers. Raised with Love in a family setting. 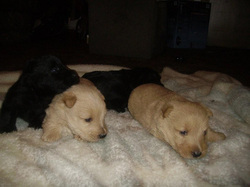 Emails about our pups once placed. This is about Abby. Got it right after she was placed. 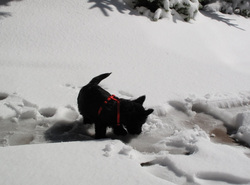 Hi Lainie, Rich joins me in thanking you for a wonderful, well balanced, totally cool puppy. 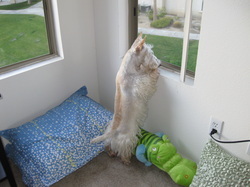 She handled the 8 hour drive back to San Francisco with relative ease, met up with our adult Scottie and huge cat with absolute aplomb, has confidently used her PottyPark consistently and slept through the entire night without a whimper. Although taken aback by the cost of the PottyPark we now think it one of our best investments...not one accident. Abby is a joy! Thank you for all. Pics soon. gal. We love having her, despite her mischief. Lainie, well Roxie had a great time in the snow this morning! She didn't mind the snow or wet at all. It wasn't really very cold outside so we let her play just a minute so we could get these pictures. There are (12) pix of her attached to this email. I took these photos myself, so you have my permission to use a couple of them for your website if you would like. She had a grand weekend. We have taken her in the car (not allowed outside of truck or on any dirt or surface, of course) twice this past week. But on Saturday, we threw her grass in the back of the truck yesterday and headed down the mountain from Big Bear to Palmdale then on to Barstow and back up the mountain. We were gone six hours. I had her bed on the floor at my feet and she stayed in it and slept for the first three hours of the road trip. She was great at using the grass in the back of the truck when we stopped a few times. She ate her puppy dog food and had water on the trip. We do drive a lot and we want her to be very comfortable with being in a moving vehicle. She had a ball. She has been with us eight days now and not one accident on our floors! We only let her out of her play yards on our floors about twice during a day and/or only after she has done both of her jobs on the grass just prior to that. She's a riot. I run around our downstairs for about 5 minutes with her running right after me just before we go upstairs to bed. She plays about 30 minutes with us on our bed, we turn out the lights and she promptly goes to sleep. The last two nights she has slept soundly until we purposely wake her around 3:00am to hit the grass on the floor to potty, put her back on her "dog afghan" on our bed and out she goes again. The last two mornings we have had to wake her up at 5:45am. This is our DREAM dog. Her personality has really emerged this week. Very intelligent and happy. She's bonded with us easily. I have her on a strict schedule. Wake up, hit the grass, eat, play, nap, eat, play, nap.... etc. She uses the grass always on her own during the day. Never misses it. And she absolutely LOVES the Animal Channel. Her hearing is amazing. Our dear Pepper was 100% deaf, so we are so fascinated by how well Roxie hears - even pays attention to the animals on "her" TV. So fun! We are very structured people: we have a daily routine that does not really change. She has fallen into that routine very easily. We've only left her twice alone in her play yard while we have gone to the store. First time: 30 minutes. Second time: 45 minutes. She was squeaky but not hysterical each time when we came home. We keep it simple and do not make a big deal about coming and going whether it's in and out of the room or we leave the house. This is working great. I hope this finds you and your family doing well! Just wanted to reach out to you today, being Wallace's 2nd birthday, and let you know what a special dog he is and how much he is loved by our family! We feel blessed to have such a sweet, good, smart and handsome dog! He is a joy in our lives and has become a best friend to our son Ethan (as was my hope)! 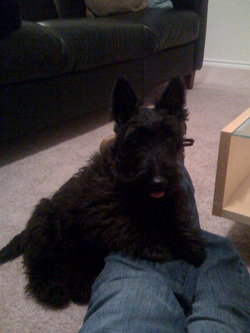 Below is a photo of Wallace taken at the end of November 2009. 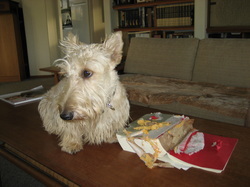 So, thank you for the wonderful job you do in breeding such fine Scotties! Casey , Casey`s mom send s me pictures via snail mail. When I get a scanner I will add updated pictures of him. This is a baby picture. He is the darker wheaten. Casey is a dark red wheaten, VERY pretty. Franklin. Franklin welcomed home- Eleanor 6 months later. She is pictured below at 8 weeks of age, with her new big girl hair cut. You can really see the brindle in her. hi Lainie, just wanted to let you know Franklin is doing very well.His coat is beautiful,brown,black,some rust color behind the ears and his tail has silver,what a handsome puppy!He is getting use to being brushed.He likes to go on little rides in my car.He is full of energy but after he plays hard he falls into a nice deep sleep. He has a wonderful personality.He is very alert,he always has to know what is going on! He does well when we leave him alone(work days).He is left in the kitchen but because of the doggie door is in and out all day. Alan and Franklin are very good buddies,they hang out together.Franklin and Squeaky have a truce.Squeaky has accepted the fact that Franklin is part of the family.She may not like it but she seems to know we will not let anything happen to her.She comes in during the evening and hangs out in emilio's room.How are the scotties doing? how is Phil and Trixie? Is another litter due soon? you must be busy! take care of yourself! Wallace P. Wallace welcomed home Calum , His wheaten full sibling, 3 years later. This is just a few emails that I have recieved over the years. I will add more from time to time ,along with new pictures. 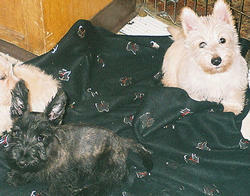 AKC Scottish Terrier breeder, Raising quality pups in our home not a kennel. Our dogs are AKC CH Sired and tested for genetic illnesses, to ensure proper health and conformation. Normally having about 1 to litters per year. On average 3 to 5 pups per year. We also do RESCUE!